Tian Tan Buddha Statue Ngong Ping, Lantau Island, Hong Kong. Tian Tan Budha also informally known as the Big Buddha is a large bronze statue of a Buddha Amoghasiddhi. The Big Buddha statue is located at Ngong Ping, Lantau Island in Hong Kong. It symbolizes the harmonious between man and nature, people and religion. 1)Tian Tan Buddha Statue sits on a Lotus Throne on a top of three platform altar. 2)It is one of the tallest Bronze Buddha Statues in the world. 4)The whole statue is divided into 202 bronze pieces and assembled all bronze pieces on a strong Steel framework to support the heavy load of the statue 202 bronze pieces. 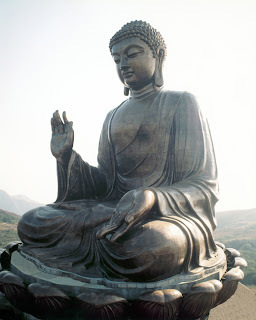 5)The Tian Tan Buddha Statue is 35metres(115 feet) tall, equivalent to 11 stored building. 6)It is surrounded by six smaller bronze statues known as "The Offering of the Six Devas" and are posed offering flowers, incense, lamp, ointment, fruit, and music to the Buddha. These offerings symbolize charity, morality, patience, zeal, meditation, and wisdom, all of which are necessary to enter into nirvana. 7)Visitors have to climb 268 steps to reach the Buddha Statue. 8)There are 3 floors beneath the Buddha statue: The Hall of Universe, The Hall of Benevolent Merit, and The Hall of Remembrance. The Tian Tan Buddha was constructed by Po Lin Monastery, Buddhist Monastery. The committee for the construction of the Tian Tan Buddha Statue was established by Po Lin Monastery on December 26, 1981. They took 12 years to complete the Big Buddha project. 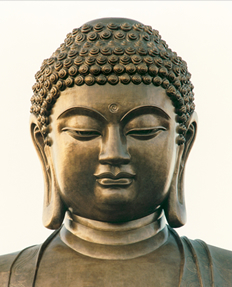 The inaugural ceremony of the Big Buddha was held on December 29, 1993, the day of the enlightenment of the Gautama Buddha, the founder of Buddhism Religion. Distinguished visitors across the globe took part in the inaugural ceremony. On October 18, 1999, the Hong Kong government issued a Stamp depicting the Tian Tan Buddha. Visitors/Tourists can reach the place by Bus/Taxi/Ferry. Route1: First reach MTR Tung Chung Station, then take Ngong Ping Cable car which takes 25minutes journey to reach Ngong Ping. Route2: First reach MTR Tung Chung Station, then take New Lantao Bus No.23 to reach Ngong Ping.